This is one of those...Good ones! We have known for a long time that Elvis was in good spirit on late December 1976. Burning In Birmingham was the first soundboard from this short tour, and what a great concert that was. The new years eve concert in Pittsburgh is probably among one of the best concerts during his last years on stage. And the concert we have here features Elvis in Dallas just some days before. 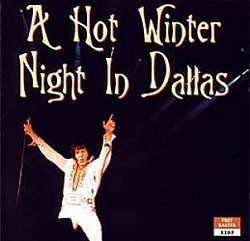 First of all; the sound on "A Hot Winter Night In Dallas" is much better than on the Burning...thing from Label 2001. Fort Baxter knows how to handle live material. The sound is much clearer, although the sound picture is the same as on Burning In Birmingham. Focus and the level betwen instruments, backing vocal and Evis is roughly identical. Elvis sets the pace already with 'See See Rider'. This is Elvis full of energy, enjoying life and performing on stage. He literally attacks every song, and sings many songs in a higher key than normal. 'Fairytale' sounds comfortable, although the key is very high. His way of treating songs reminds a lot of how he did it in autumn 1974. But here he does it better. The smoothness we find in spring 1975 and early 1976 however is gone. 'My Way', for instance, gets a little too messy at the end for my liking. Most versions from 1977 are more impressve. In general there is not so very much to say about this concert. It features Elvis in great shape. He sings with a lot of conviction, a lot of power. Still, he is not at all so focused on the songs as in spring 1975, for instance. In my point of view, Elvis sings a lot better in Las Vegas March 22, as featured on The King On Stage Vol. 2, then he does here in Dallas. A Hot Winter... however is hot until then!! After such a gruelling year of touring, it would seem unlikely that a short "mini-tour" of 5 dates (December 27 - 31) would unleash an Elvis at his most powerful, creative and inspired (by late-70's standards). I don't know whether it was his recent weight loss (Elvis looks at least 20 pounds lighter than he did that summer), the naive excitement of new-found romance (Ginger Alden) or the fact that, with only 5 shows, he found he had more energy to pack into each performance, but the quality and consistency of these shows is nothing short of amazing. The Elvis you hear during these dates sounds healthy, strong and delighted to be on stage. It is hard to imagine from the performance on this recording that the man singing had six months to live. From Elvis' very first breath of 'See See Rider' it's evident he is bursting with energy and enthusiasm, playing incessantly with phrasing and just having a blast. This upbeat, playful mood continues throughout the show. What a relief after hearing countless, uninspired "going through the motions" concerts where the listener can predict virtually every cue, every accent, every "ad lib". "I'm crazy, you know that - don't you? ", he jokes to the audience during the 'Amen' bump - and- grind bit. So we've heard, Elvis - but this time his "craziness" is tasteful, clever and amusing - a welcomed relief from the embarrassing, caustic and inexcusable nonsense displayed all too often in so many other shows. He plays with some songs here in a way I've never heard before or since. Listen to the vocal acrobatics he pulls at the end of 'Love Me' - a song usually "performed" on "automatic pilot". At this show - and in the others during this five date mini-tour - Elvis seems inspired to be creative and attempts to wring everything he can from almost every line. Next is 'O Sole Mio'/'It's Now Or Never'. Elvis can't get enough of this one. He goes nuts on it. He plays the Sherrill Nielsen "shtick" to the hilt and has him reprise the 'O Sole Mio' bit-much to his (verbal) amusement. Then it's onto 'Tryin' To Get To You' and a quick, energetic 'Blue Suede Shoes'. The atmosphere on stage was so inspired he intuitively decides to steer away from the patent "scarf-number" routine - "No Teddy Bear - forget that", he says. Great idea, Elvis! He starts 'My Way' instead. When he comes to the line "I've lived a life that's full" he adds ,"almost". This version is done with a lighter, less maudlin tone and the result is very unique. Next is 'Polk Salad Annie', always a great number for Elvis to "rock out" on. It sounds like he was going nuts with his stage movements because he doesn't sing it straight - he's too involved pulling out all the stops. It's easy to visualise him - gyrating and punching his fist mercilessly into the air. Next are the long band intros which he started to "pad out" earlier that year, presumably to give himself a chance to "take a breather". Usually he just mumbles through these truncated "songs" but tonight, he's even into these. During Tutts' wild jungle- drum solo, Elvis plays around with the line "Hey Bo Diddley", and accompanies the others with improvised vocal scatting. He is ON!! He has fun with 'Love Letters' - a fine version - and then runs through 'School Days' into 'Hurt'. The tempo of 'Hurt' is a bit rushed, and suffers as a result, but he pulls some more vocal acrobatics at the end and reprises the climax. He takes a seat at the piano for 'Unchained Melody' - but it doesn't work like it should. He's too uptight and out of breath, but still finds some fresh ways to phrase some of the lines. A fair performance - but it was new to the show and Elvis wasn't quite comfortable with it yet. He would nail some awesome versions of this song later, during shows in 1977, which THANK GOD - were captured on tape by RCA. 'Can't Help Falling...' follows. My contention has always been that if it were these shows that had been filmed and recorded by CBS/RCA - it would have given Elvis a new lease on life. These five shows are enough to convince anyone Elvis still HAD IT at the end. This CD is a prime example of how bootleg releases can enhance Elvis' image and provide fans with invaluable career moments that otherwise would be lost forever. Many fans know of course, that this "mini-tour" ended with the legendary New Years Eve concert in Pittsburgh. That concert should have been a network TV-special or a pay-per-view event. Hopefully someday a soundboard recording will surface. Until then - if ever - I recommend AULD LANG SYNE - as good an audience recording as you'll find of that extraordinary show. There is also BURNING IN BIRMINGHAM, another soundboard from this series off shows, although the mix is very imbalanced and the sound quality a bit thin and lifeless-but it's another "keeper". © Joe Russo, U.S.A - June 14, 1999. From the first moment Elvis entered on stage, on that December night in Dallas, he was the definition of rock and roll. Nobody can really know what happened to Elvis in this particular moment of his career, but whatever it was, was strong enough to make him wish to please everyone in the crowd, prove to everybody that he was the truly greatest singer of all time, and that the time, has not dismissed his talent. Because of this convictions, he explodes into 'See See Rider', singing it as if he could not contain his energy, it reminds the listener of his 69 performances, although his almost 42 to years of life was now making the difference in his shows. By 1976, his voice was no longer the raw voice of his comeback, nor he had that infinity energy, but on his own, he managed to keep the stone rolling. And the performances on this record can prove that. The rocking numbers such as 'Polk Salad Annie' and 'Trying To Get To You', could blush Jagger and Jim Morrison, with such vitality and strength, and the more emotive songs like love letters, and you gave me a mountain, proves Elvis mastery for hapless songs. But the truly greatness of Elvis can be appreciated in two showstoppers, being they 'Hurt' and 'Unchained Melody'. 'Hurt' is such a great performance, that makes you want to be there just to have you ears pierced by the high ending note (only reached in the ending reprise) that he keep holding even when you think he could not. By the end of the show, he decides to do his "new" song, an old Everly Brothers tune: 'Unchained Melody'. The beauty of this particular performance is in the simple piano playing treatment given by Elvis simple knowledge of the instrument, his missing notes, and all the insecurity of a almost complete non rehearsed song (this was the second time Elvis performed the song), compensated by his emotional delivery of the piece. It has some faults, but Elvis alone make up for it with his heart. By 1976, the Elvis Presley show had stuck on the same repertoire, but there are a few surprises in the show, like a complete version of 'Early Morning Rain'. It seems that only when he was feeling good he delivers the complete version, as with 'Hurt' and its reprise (and the high ending note), and in the 50's segment we have 'Blue Suede Shoes', rarely done in the late 70�s. 'Fairytale' is also in the repertoire and is one of the best versions he ever done. The show itself is very "speed-up", and even the band segment is very entertaining, especially David Briggs electric piano solo, and even in the band mates solos, Elvis is on fire, singing and shouting like a real rocker (He even sings a little of 'Hey Bo Diddley' on Tutt's solo). As for the sound, it is a top quality soundboard. It's not lively as Holding Back The Years, for example, but everything is well audible and balanced. The artwork is simple, but good. When you listen to this CD, you can help but feel that Elvis had discovered the joy of living and perform again but, sadly, this wouldn't stay long. This is probably the last time Elvis was really Elvis on stage. Energetic, humorous and pouring his heart. If I could go back in time I would put this show on my schedule, for it was a kind a rebirth of Elvis after almost a year in a depression state. © Sergio Luiz Fi�a Biston, January 2002. 4. Comments by Brandon Matsler. Elvis in Dallas (for the last time)12-28-76. This is a truly great show, you can tell right away he's in a great mood. This is simply a must have for any Fan that truly loves hearing Elvis sing his can off! Highlights: 'See See Rider', 'Love Me', 'Fairytale' (his life story) and 'It's now or Never' (the comradre between his band is awesome). Just buy it if you get the chance you won't be dissapointed. If you are... what can I say?